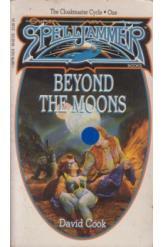 Beyond the Moons by David Cook, Sci Fi. Book is in good condition, all pages intact. A simple farmer on the world of Krynn, Teldin Moore's life is changed forever when a magical spaceship crashes into his farm. Given a magical cloak and a cryptic message by the dying pilot, Moore finds himself fleeing from a group of monstrous hunters across the world, and ultimately into the alien seas of Wildspace. Book one of the Spelljammer: Cloakmaster Cycle series.